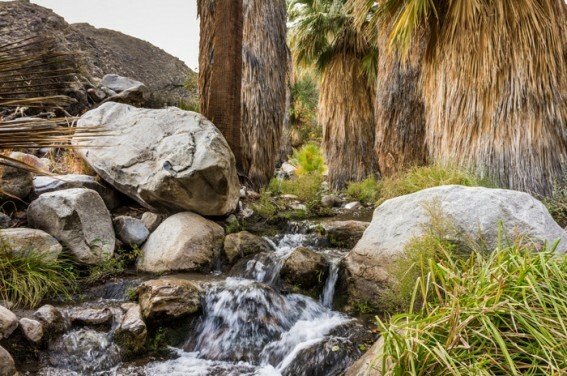 When much of the country is under the grips of Mother Nature’s deep chill, Palm Spring’s beautiful weather is beckoning your family to come explore the great outdoors. Winter temperatures are typically in the 70s, making it the perfect time to enjoy all the desert has to offer. Many visitors come to golf or lounge by the pool but the desert wilds around Palm Springs deserve your attention as well. 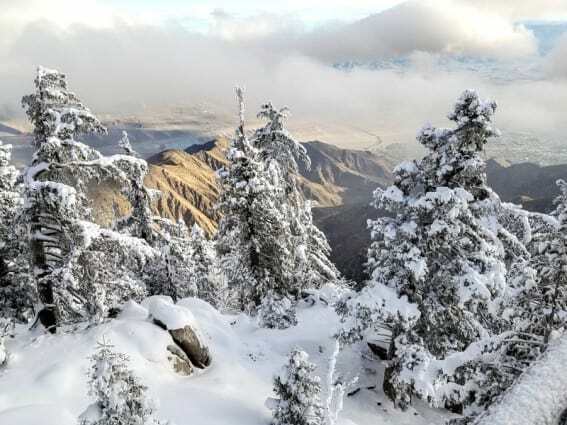 From jeep tours to snow play to National Park adventures, here are some of our favorite outdoor experiences near Palm Springs. Owned by the Agua Caliente Cahuilla tribe, Indian Canyons are lush, palm-filled canyons fed by a shallow aquifer. Andreas Canyon features a short, 1-mile loop trail that follows a stream back into a canyon shaded by fan palms. The star of the 3.9-mile Murray Canyon Trail is the Seven Sacred Sisters waterfall. Palm Canyon is one of the largest palm oases on the planet. A trail leads 15 miles back into the canyon; follow it for as long as you would like or just enjoy splashing in the streams and having a picnic lunch under the cooling palm trees at the base of the canyon. Did you know? Palm Springs sits on the 4th largest aquifer on the planet! Where else can you trade sun-kissed palm trees for snow-blanketed white firs in just 10 minutes? Located just six miles from downtown Palm Springs, the Palm Springs Aerial Tramway takes riders on a scenic, 2.5-mile journey up the steep mountainside of Mt. San Jacinto. Temperatures are often 30-40 degrees cooler at the tram’s Mountain Station, elevation 8,516 feet, and the views of the entire Coachella Valley are spectacular. During the winter and early spring months, snowshoes and cross country skis can be rented from the Adventure Center. In the summer, escape the valley heat and discover a wildly different environment complete with 50 miles of hiking trails among ancient boulders and towering evergreens. Looking for lodging? Read Trekaroo’s guide highlighting top family-friendly hotels in the Palm Springs area. 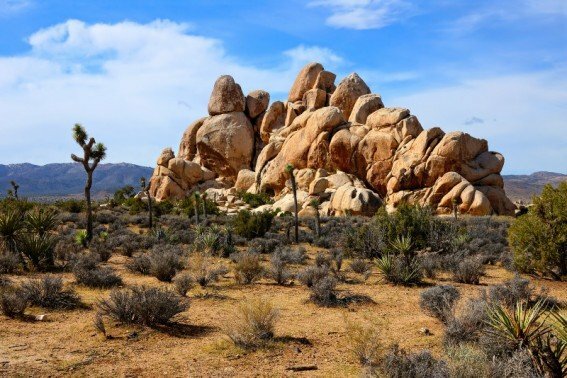 Named for those Dr. Seussian trees that speckle the high deserts of California, Joshua Tree National Park is an awesome day trip option for those vacationing in the Palm Springs Area. The park has long been a destination for rock climbers and offers plenty of opportunities for all abilities to scramble, clamber, and scale jumbo-sized boulders. During the spring bloom, the desert becomes awash with natural color. The lemony scent of turpentine broom fills the air while tiny pink and yellow wildflowers sprinkle the sand. Cacti of all shapes and sizes are topped with showy flowers and even the Joshua Trees themselves burst into bloom. Temperatures in the high desert of Joshua Tree are often significantly cooler than in the Coachella Valley so be sure to check weather reports before heading out. Good to know: There are no services in Joshua Tree National Park so be sure to pack a lunch and fill up the tank of your car before heading out. Check out our guide to visiting Joshua Tree National Park with kids. 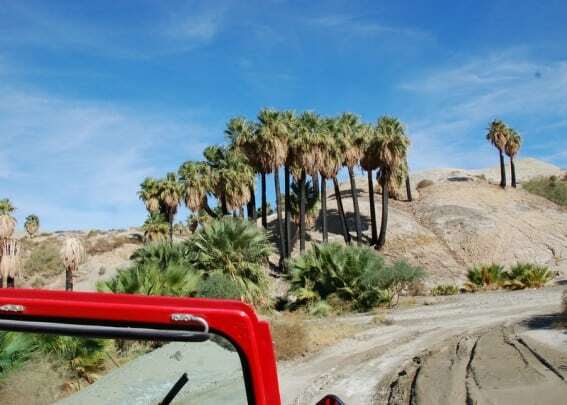 Take a red Jeep ride into the desert with an expert guide from Desert Adventures. Your guide will passionately introduce you to the wonders of the desert, including the jagged results of the Pacific and North American plates colliding while standing atop the legendary San Andreas fault. Learn about how native cultures used the natural resources of the desert to survive. Zip through slot canyons where portions of the original Star Wars movie was filmed. Visit a palm oasis where water bubbles up to the surface (an actual palm spring!). Want more family-friendly fun in Palm Springs? Our guide to Palm Springs with kids offers great suggestions.